Another Saturday very well spent with Tina. Because I am also tight with my tuition schedule, Tina always tells me to leave the concept of my Excluzif apparels' photoshoot to her. So, the past photoshoots were all planned by Tina whom you know by now is not only a make up artiste but a choreographer...stylist...etc. Tina, I am very blessed to have crossed paths with you sister. Thank you to Jali for this. If it weren't for him, I wouldn't have met Tina. Yesterday, Tina was like a headless chicken running around. So busy. Tina briefing my photo-brudders Jali, Aza and Franco. Man, I am bursting with excitement as I'm typing this. I am very happy to have met with an inspiring young lady by the name of Farah. 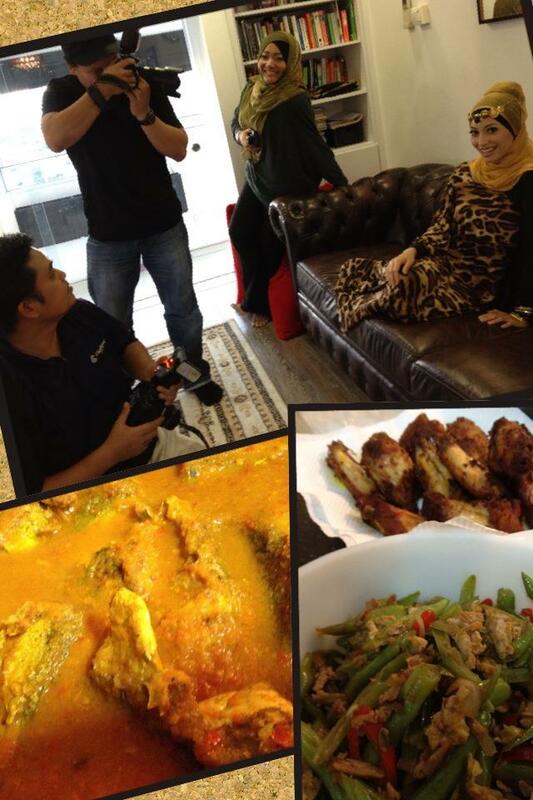 Thank you Farah for your precious time. Last Saturday, we had a bukan calang calang orang punya model to join us in our shootout. Her name is Leah Johnson. Tina: Ok guys, Leah is from Project Runway Australia. The Boys: We also whaaaaat. We from Project RUNAWAY. Very lame my brudders, I know but love them anyway. The moment Leah stepped in, all of us just stared and stared and stared at her. Ma Shaa Allah, she is so beautiful. And then we found out that she used to be in Australia's Next Top Model! Thank you Tina for styling Leah in The Excluzif Scarves and our navy blue Maxi Toga! Ok my namemaster, Nyla has decided to do away with 'Glitter'. 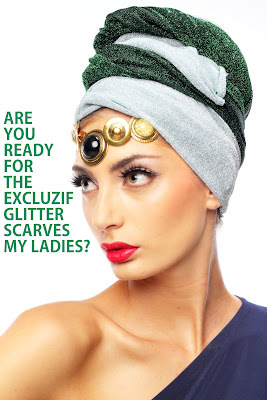 She has renamed them as The Excluzif Twinkle Scarves. We even came up with a song. *Do sing along to the tune of 'Twinkle Twinkle Star' okay! Okay my hijabellas, the moment you all have been waiting for. 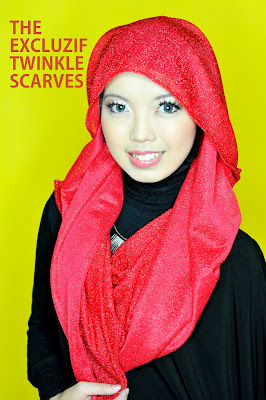 I present you The Excluzif Twinkle Scarves yo. A piece is just $25. Happy considering which Twinkle to order ladies. There are some people who are born beautiful with a slim face, big eyes with long dark lashes, small sharp nose, flawless skin - the works. The rest of us, however, aren't so lucky. So some of us wallow in self-pity everyday and wonder why life is so unfair. Some resort to paying tons of money for plastic surgery. Also Tina's close friend and a former cheecher like me, this woman is so bubbly she lights up the whole room. Great sense of humour aside, when it comes to work, man, she is serious. Tina also looks up to Nora Zee because she is always updated with the latest make up products and techniques. Few weeks back, she tried a few hijab looks on me. Many of you are very interested with the dual inner. This one is Norazee's trademark dears. Do ask her how she does this k! Thanks mom for the pweety pweens Maxi Toga! I am a makeup junkie and not ashamed of it. I LOVE, more than anything else I do, to help make women more beautiful, in and outside. I have made many women beautiful and feel SUPER confident on their big day. YOU, too, can be beautiful and confident. All you gotta do is send me a message! Okay girlies, the moment you all have been waiting for. HOW TO GET IN TOUCH WITH THIS FAIRYGODMUDDER WHO CAN TURN ME INTO A HIJABELLA?! Add this funny lass HERE on Facebook. Okay, still at the topic of hijabs. It has only been more than a month and already, my wardrobe is bursting with so many scarves. Mom: Terok ah dekni. 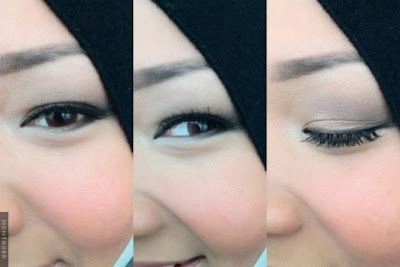 Aku berpuluh puluh tahun pakai tudung, takda sebanyak macam kau Kin. Even though I have aplenty, I find it difficult to find scarves that are age appropriately glamorous. You know what I mean? 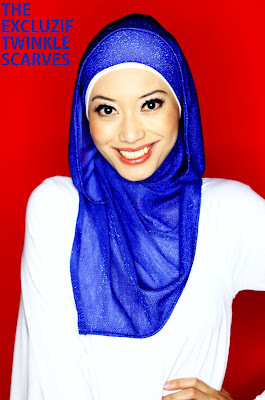 The jemputan or dinner functions kind of scarves. And no, I will not wear the manik manik kind k.
If cannot find, make lor. Must thank Tina for her input. Mwaaah! 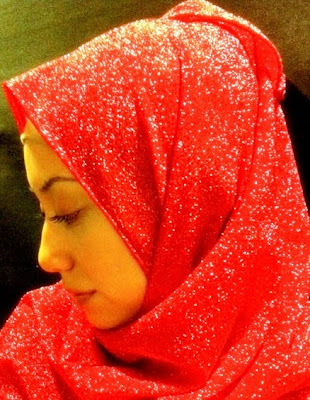 I am scheduled to have a photoshoot with these Excluzif Glitter Scarves this Saturday after tuition with Tina at her friend's studio. This glitter scarf can light up your look (and mine!) instantly. Nyla has not come up with the names of these scarves yet. She will do it this weekend. Maklomlah, dah start primary school, orang tu busy. Should you want to wear any of these Excluzif Glitter Scarves this weekend, do let me know. Can make special arrangements one. Too beautiful a read and to not share it is such a waste. Misa, thank you for sharing this at Facebook. 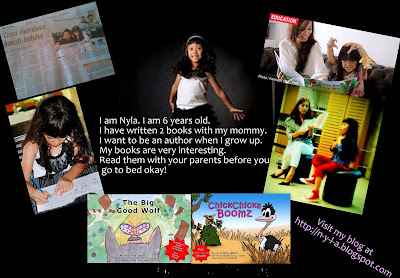 Since we are at the topic of reading good stuff, for those of you with children, do add Nyla's The Big Good Wolf and Chickchickaboomz to your bookshelf. I assure you that your children will enjoy these 2 books very much. For those without children, I cannot say this enough but I absolutely love it when people give Nyla books as gifts. So if you have a lil cousin, nephew and niece, gift them books. The Big Good Wolf is $10. Do email me at nuraesman@gmail.com because last week I have received a few orders, hence will be mailing out the books later in the afternoon. Ok this is totally random, but what's up with shopping at the school bookshop man? Nyla absolutely digs her school bookshop man!!! Typing as fast as I can so that I won't be late for my class later. As the school term has started, my tuition sessions pon sudah start engine already. Another busy year ahead but Alhamdullilah, busy is good! My Primary 5 and Primary 6 classes are full and I intend to keep this group small because I really want to focus on each and everyone of my graduating tutees. Hence if you have emailed me and I didn't reply, my sincerest apologies. I also have another group of Sec Ones. (Yes, all Bottoms Uppers since last year.) Very nice to have them back with me as I hope to see 5 of them make that switch from Normal Technical Stream to Normal Academic stream and 1 from Normal Academic stream to Express Stream. ALL of them in fact look very hungry to make that switch, I'm real proud. And then my Primary 1 babies. They are so cute caaaaaannnnnnnnn?! And such a noisy bunch! They really have loads to share. The reason I open up a Primary 1 class is because I have always enjoyed teaching Nyla at home and why not I extend these lessons to other children who'd love to learn and play at the same time. Nyla too is having a blast because she has new friends. Still at the topic of education, I'd like to congratulate my dear Jenn for securing a writing workshop programme in a primary school. Yahoo!!!!! This time round, my turn to assist her and be one of the workshop trainers. Anything for you Jenn! Last Saturday morning, I had a photoshoot for an online shop which was first based in Washington and now spreading its wings to sunny Singapore. How cool is that?! I'll blog about this soon enough. And of course, I tarik Tina along and included her in this assignment. So we both started work real early. She fetched me at 6.50 a.m. By 10.15 a.m we were done and while I rushed home for tuition, Tina rushed for her other make up assignments. To view Tina's many many make up assignments and the many shoots she has choreographed, please do add her as friend on Facebook. Happiness I feel is truly infectious and truly, other people's happiness can influence your mood. I feel very proud of my beauty sponsor, Harnies Beauty! She has only just released 2 scents! Only just released a few days ago and more than 50 bottles have already been sold. Awesome stuff. One of her Facebook friends described 'CLASSIC' as smell of vanilla and caramel like a sugary sweet cake topped with ice cream. Once again, big fat congratulations Harnie! 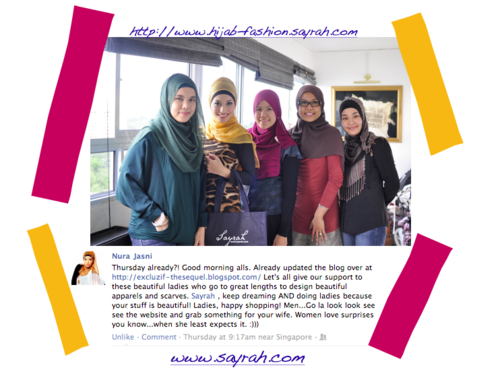 SAYRAH sisters, thank you also for your wonderful blog entry here. It has been such a great start to such a marvellous Monday. Ok got to go for my lesson already. Lunching at Geylang later with Shikin who will be fetching me later (WOOOHOOO!) as well as Diana who will be joining us after she has settled her kids in school. Really, I feel very blessed to be surrounded by such positive forces such as all these wonderwomen I have mentioned in this entry. Girl Power la! Hehehhe! Great day ahead you alls. Just you and your spouse....Both of you holding hands...Putting arms around each other...Smiling at each other...Sharing conversations...Intimacy. SO FUN TO FANTASIZE hor? In reality, one of you (as in either the wife or the husband) will surely say this one when you ask your partner this question. E and I are entering our 8th year of marriage this year. We have been on numerous family vacations but the last time we enjoyed a just- the- two- of us vacation was in July 2008. I can't remember the exact date but that Saturday is still very vivid in both our minds. E's good friend, Zach, invited us to his birthday celebration at Johor Bahru and booked a hotel room for us. That night was just very amazing. E and I were so relaxed, our couple-ness renewed by that one night away from the everydayness of 'home' life, that time devoted to total rest and relaxation and focused on just us. The past years, as much as we shared aplenty wonderful moments, menyampah moments pon ada jugak beb. Both of us get burned out on our jobs...parenting duties....get tired...so snapped at each other la. What?! You all actually think marriage is easy peasy lemon squeazy?! Marriage is hard work hor. 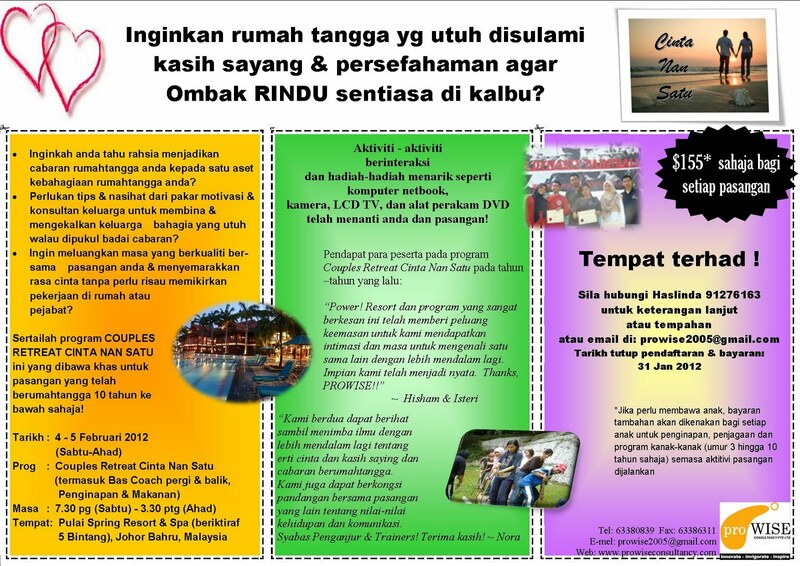 Planned activities with the purpose of rekindling your romance. By the way, the purpose of going for a getaway, in my opinion, is not to save your marriage...to repair your cracks etc. Going for getaways must be seen as fun and exciting thing to do! Baru ada uuummmppph! It is a time for you to re-connect...re-engage NOT, repair. Should your marriage have cracks, I recommend marriage counseling before you go on a vacation with your spouse. Settle your unresolved issues first. "He who returns from a journey is not the same as he who left." May you and your spouse come back from Pulai Springs all recharged and re-energised and most importantly, your love more intense. Really at ONLY $155, it’s worth all the hassle, time and expense. Consider this as an important investment in your marriage. Do call Haslinda at 9 127 6163 if you're interested or email her at prowise2005@gmail.com. Closing date to register is 31 January 2012. If you think wearing a hijab limits a woman’s options in terms of wardrobe, aisey, you are so wrong man. Hijab-wear is no longer the boring mak- mak jubah type k.
Funny how wearing the hijab has made me less resistant to trying out different types of clothes. The fusion of fashion and hijab. Beautiful stuff. I strongly believe that modest dressing should not necessarily be plain and dull. Not supposed to make you look sloppy and unstylish. Besides, we must all dress up to feel more confident and appear presentable. With regards to my wardrobe's latest additions, I must express my gratitude to a group of 4 ladies. 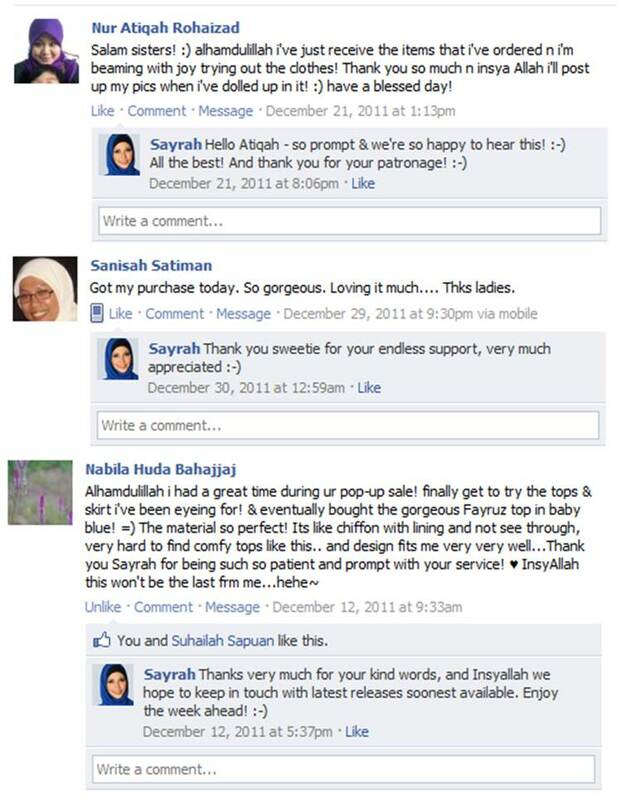 Sisters in law to be exact and they have combined their powers to set up SAYRAH HIJAB SHOP. Sulastri has the passion and dedication for entrepreneurship, always exploring and embracing good networking opportunities, here and globally. She tackles everyday challenges of that of a busy working woman and a business partner. Also a mother to two active young children, she understands the need for Sayrah fuss-free pieces that can be assembled in a jiffy on weekday mornings! Sheikha is our resident design buff. Not a novice juggler, she's due to complete her business degree from London School of Economics next year, whilst blogging for Sayrah since conception! An active constituency member in school, she spearheads and facilitates dakwah projects. Passionate about the community welfare, she hopes one day to touch many lives, especially the Muslim population through the empowerment of beautiful & strong Muslim women of the new age as well as tackling the worldwide problem of income disparity between the rich and the poor. Aishah Haroon, a chartered marketer with over 13 years building solid client relationships in leading advertising agencies, brings business savvy, marketing aptitude and the phenomenal juggling ability of a successful working mom to Sayrah. Aishah Sheikh Ali, has 7 years of experience in corporate communications, training and events management which involves interacting and building rapport with many customers from diverse background. She believes that good customer service is the lifeblood of any business and pays closest heed to address Sayrah’s customers’ needs promptly. Modest is good, beautifully modest is our key goal! " Saaaapppppp. 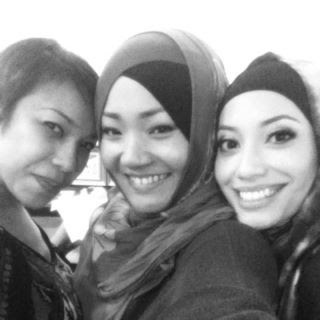 Steady bom pi pi la sisters! Hehehe! These admirable ladies really pay close attention to those fine details which they know need to be covered - from selecting materials that are fine, fluid and yet not too sheer or see-through, to designing cuts that do flatter but not at all revealing. Embracing the lace trend with this stunning one-piece dress, featuring a ribbon-style waist belt and multi-tiered skirt, SOPHIA ANGELIC LONG DRESS is a great addition to your wardrobe! Be a trendsetter in this layered skirt made of bamboo fibre. With its hypoallergenic and antibacterial benefits , bamboo fibre is one of the softest fabric on planet. You will love the way it feels! The above TRISYA POCKETED LONG SKIRT is in my wardrobe now! I tell you the material is so softtttttttttt. Comfy gilz. Stylish gilz. I would also like to bring to your attention SAYRAH's Aliya pleated shawls which come in SEVEN colours. 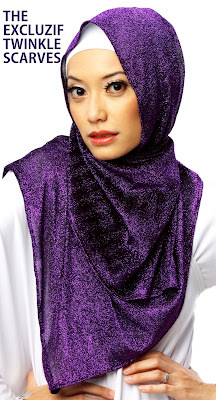 Undoubtedly a must-have staple, basic in every hijabi's wardrobe! Ultra reliable, versatile and easy to match with any outfits. Easily worn for work, school or at play as it drapes and sits nicely too. And as you can see, I'm not the only one pleased with SAYRAH's clothings and accessories. Time to BOOKMARK these sites. You may embark on your shopping spree at SAYRAH HIJAB SHOP HERE! If you like to surf blogs, then SAYRAH'S blog should be one to bookmark. Click HERE. Follow SAYRAH HERE on Twitter! FREE exclusive Sayrah non-woven Shopper Bag & 10% OFF! Been such an overwhelming week. I've started studying again and the topics learnt the past few days are very cheem one. Once I'm more settled, I'll blog about this. My family has been urging me to take this course for the longest time. A case of them always insisting...and me resisting. So imagine their joy when I finally said,"Ok Ok la. I'll do it." Mr E's school term also has just begun and he is extremely busy with Singapore Poly Open House. I thought I'd drop by his school yesterday but my meeting overshot sikit so today it shall be since I no longer have to be at Nyla's school during recess. Ah and there's Nyla's school. Very grateful to my brothers and parents for taking over the sending of Nyla to school. First day was a disaster by the way. She cried and was so clingy to my mom. And my mom being the protective grandmother also refused to let go of Nyla. WALANDE! When I called Mom to check on Nyla, she was crying too la. "Kesian Kin, Nyla nangis... Jangan suruh Mak hantar la. Sedih la." Aisey, Mother ahhhhhh, how come when I was in Primary 1, you didn't cry along with meeee? Nyla wasn't her chirpy self when I fetched her on the first day. Nyla: Mommy, just sell my bag and uniform la. I'll stay home. Jambi and Bah took time off to handle their niece and she was okay. No tears whatsover! PHEW! Nyla: Lucky you never sell my uniform, Mommy! School is fun! Upcoming blog entries are gonna be interesting. Just last Monday, I had a hijab photoshoot with the RebelPixel Photography team featuring an amazing make up artiste who happens to be Tina's close friend. A hijaber herself, she is fantastic with hijab styling! So those of you getting engaged or married this year, you so gonna love this hijab fairy godmother who can turn you into a hijabella! 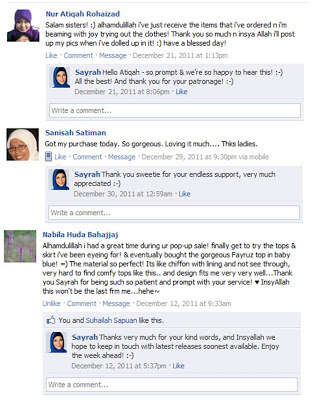 And I will also be featuring a hijab online boutique run by four amazing ladies next week. Tomorrow my Primary 1 tuition class will commence! 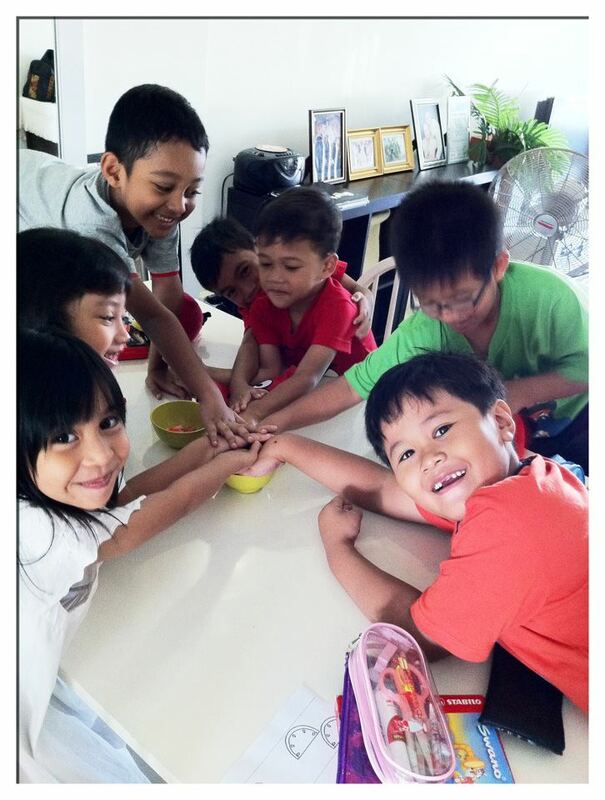 If you are staying around Jurong and your child is free from 11 a.m. till 12.30 p.m. every Saturday, do send him/her over to my place at Pandan Gardens to join Nyla and her friends for fun filled tuition sessions. And definitely with each passing new year, we are closer to the end actually. I must thank Sister Raudhah for always notifying me about interesting activities that are happening. If it weren't for her, I wouldn't have attended Ustaz Kazim Elias' talk at Yio Chu Kang Stadium last night. I don't even know of this wise man's existence la. Now I do! And when I do, must loudhail and share with you people. What more good things that can benefit us in our afterlives. Ustaz Kazim is such an entertaining speaker. That ability to make you ponder about your weaknesses, (how small we really are) and at the same time he can make you laugh your intestines out. 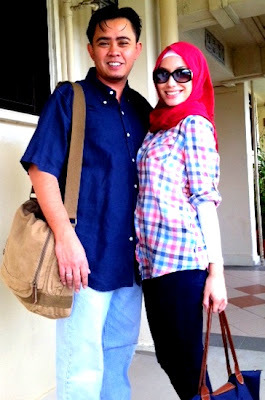 Mr E and I will be going to Al-Mawaddah mosque (At Sengkang) at 9 a.m to listen to him. 2011 and the previous years have been wonderful. As well as not so wonderful. There were moments I regretted, never wished I'd done but there is really no point in regretting because there is nothing you can do about them except to move on and strive to improve. I have felt an immense state of sadness too the past years but in those moments I have also found intense happiness. And for this, I thank only the One Above, my Creator, Allah. Happy New Year my readers and I thank you for enjoying my blog entries!